This screenshot was just posted up on Twitter. What does it mean? The Free Realms Pirate Treasure Hunting minigame! It means that Pirates are coming to Free Realms! No longer will those pesky Ninja get to rule the roost, for their nemesis is upon them. I think I just found a new favourite career. There had been rumours that the scurvy swabs might be incoming, ever since a sharp-eyed dataminer found piratical content in some of the gamefiles. Now we know for sure. There’s no real details as yet beyond that screenshot, but it matters not one jot, for you see, as I’ve said before, Pirates make everything better! Update: The Free Realms blog just put up a little bit more information, and some more pictures. I’m still unclear as to whether Pirate is going to be a new job or not, but either way I’m looking forward to setting sail when Pirates come to Free Realms! UPDATE: More information! Pirate’s Plunder will be arriving this very Friday. I’ll start polishing me cutlass. Avast ye! This is Bitey, Maltheas’ new Armoured Highland Stalker mount that came with the Sentinel’s Fate collector’s edition that I won. It’s very nice, with a 65% speed boost, and a realistic feline run animation that is so bouncy that if I use it for too long I get motion sickness. For looking cool, though, it’s top of the heap of EQ2 mounts at the moment. 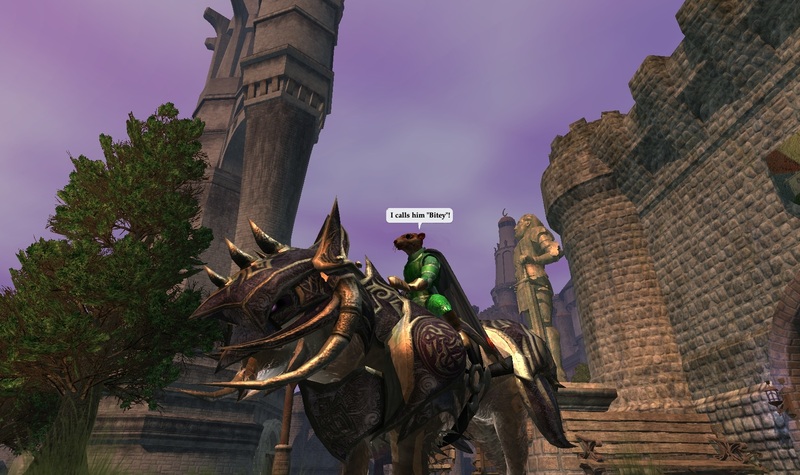 EQ2 has a fair variety of mounts. There’s a vast range of horses, bears, and rhinos. Even some flying carpets and magical platforms. As there is a definite progression of mount speeds and buffs, often you outgrow them, but recently we gained the ability to turn unused mounts into house items, so we can still take care of our loyal friends. Here is a family photo of Maltheas’ mounts. From the left, we have a pack unicorn which grants bonuses to harvesting. The Armoured Pinto, which gives bonuses to xp gained while mentored. The Armoured Highland Stalker is my fastest steed at the moment, but has no other bonuses. Finally the Ykeshan bear, who came with Shadow Odyssey. The bear is a bit of an oddball, as it grows with you as you level, starting off as just a pet that follows you, then becoming an ever faster mount. At the moment he’s the slowest of the gang, but one day he’ll outstrip most of them. Flying 2 feet above the ground is the only way to travel! Curse you, Free Realms, for having the most awesome mounts ever!!! Sure, they cost 500 Station Cash each, but who would be able to resist their own flying dragon mount, in six delicious colours? I wonder if there is any way they could be reused (with a less cartoony skin) over in EQ2? Looks like these Free Realms Summer themed quests are only going to be available for a while, so catch ’em while you can! * …and Sizzlebottom is trading pinwheel fireworks. Check it out! * A new camera controller has been added. You can turn it on and off from your game options menu. There are new items added for the Seaside Summer Splash Holiday celebration! Visit Seaside for the Summer Splash Events! 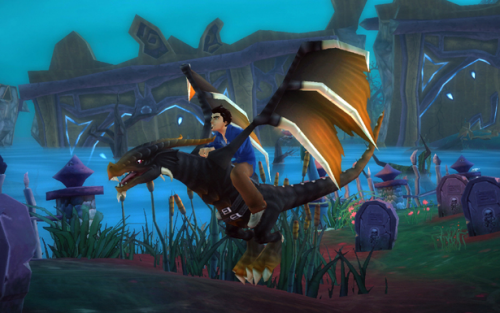 Seaside is the place for Free Realms summer fun! Complete quests and earn Seaside Stickers that you can redeem for special fireworks, fun wearables and other cool items! Card Duelists have a chance to challenge Grekel to a special scenario. Winners receive the exclusive Star Shot Candle firework! These activities are only available for a limited time, so log in and visit Seaside today. Members receive the exclusive Summer Sparkler Bundle! * Light up the night with a special blur and green sparkler set. Some very cool info from Pex about what is coming up soon. I’m particularly looking forward to the driving jobs. They’re one of the most fun things to do in Free Realms, but are woefully underused due to not giving much in the way of rewards. When I can find other players to race against, it’ll “kick drive shaft”, as Jazz would say. * Demo Derby and Race Car driver will be able to advance to level 20! * Each job will have 40 missions along the progression path. * Soccer Star (not sure if that is the final name, or a description) will be a new job! * Guilds will be able to have matching uniforms for soccer. * We showed a new desert region that will be the home of the dwarves. * A new Druid job will come will be part of this region. * TCG – There will be a feature where you can have your character portrait added to a physical card. You can buy a bunch of cards and give them to friends who can use a digital code to add your card to their digital deck. There should be more detailed information along in the next few days. The Druid job sounds interesting, though I’m not so much into the combat classes. If it has similar attributes to other games, we might be looking at shape-shifting, or combat pets being a part of that job. Free Realms June 22nd Update notes. I don’t see me joining a guild in Free Realms, but it is still the feature that marks yesterdays patch as one to notice. Fresh news from the depths of the Free Realms twitter feed. The first iteration of guilds will be arriving “very very soon”. Not much information at the moment, beyond a 32 character limit for guild names. It’s a pretty big deal though, as it is a basic MMO feature that Free Realms has been sorely missing. 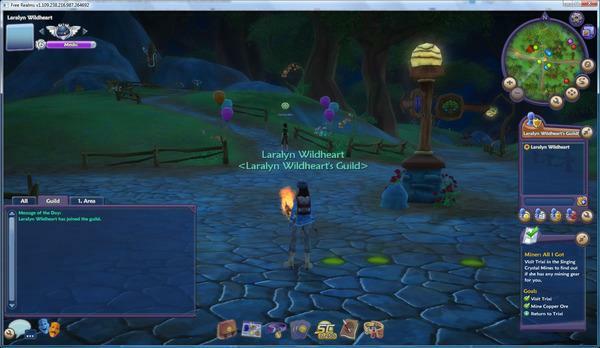 In the picture below, we can see a guild tab has been added to the chat window, and there is a guild panel on the far right. Free Realms June 4th / 5th Update notes. Only got highlights info so far. I’ll update when and if full patch notes appear. With patches coming on a weekly basis at the moment, I’ve been very satisfied with the amount of goodness in them. Of course, we are in the early phase of a game wherein the new content is mostly stuff that ideally would have been in at release, but wasn’t quite finished in time. Thus it is hard to judge accurately what the future flow of new things will be like, once the reserve of goodies is exhausted. Time, as they say, will tell. 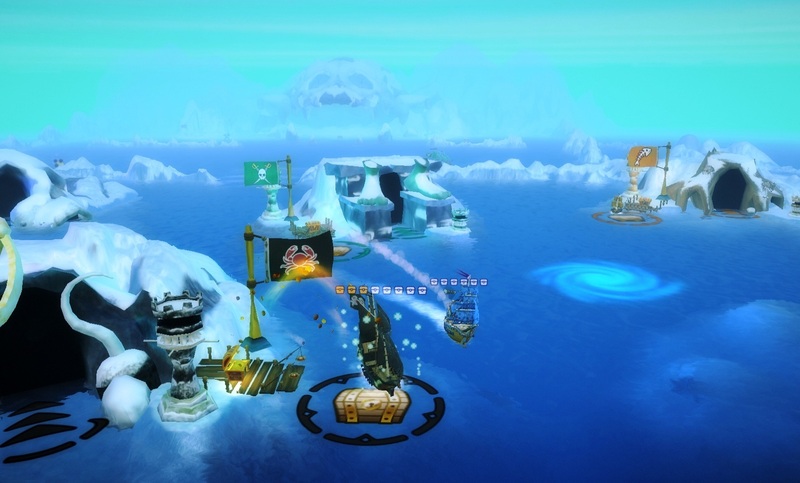 For now, I’m off to go play the Tower Defence quests in Snowhill, so I can dress up like a penguin! * * Four Tower Defense Strategists are offering special rewards for those that can master their favorite minigame! * * Collection categories have been added to help organize collection.